Norwegian film director Roar Uthaug (The Wave) brings us the new origin story for every video gaming teens favourite character, (or was a teen when it first arrived on our screens) Lara Croft. It is written by relative new comers Geneva Robertson-Dworet and Alastair Siddons, (Trespass Against Us) and it shows in the film, if you want to revive an established character you should employ writers with some gravitas behind them. We at RRR watched the 3D version which you’d expect to see a reflection of yourself ducking and diving as you avoid the arrows and bullets, but this is a more depth of field kind of effect which shows off the lush film settings quite nicely. 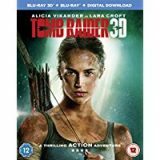 Lara Croft (Alicia Vikander, The Light Between Oceans, Ex Machina) runs her own life the way she wants to and as a bicycle courier she tries to earn a meagre wage delivering take away food. She hears from her fellow cyclists that they are doing a fox hunt, where the fox could win £600 if the fox gets away. 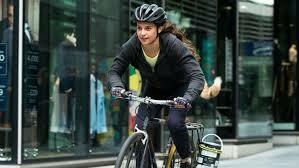 Lara decides to be the fox and a high speed cycle race breaks out through the busy streets of London’s city centre. Thinking she has spotted her missing adventurer father Richard Croft (Dominic West, 300, Punisher: War Zone) she is distracted and has a collision with a police car ending up with her in the station. Ana Miller, (Kristin Scott Thomas, The English Patient, Salmon Fishing in the Yemen), Richard Croft’s business partner turns up and informs her that after seven years it is about time she signed the death notice for her father, if she does not sign, the successful business will be sold off and more personally the Croft manor will be sold off as well. When Lara turns up at Anna’s office ready to sign the death certificate, in the conference room is Mr Yaffe (Derek Jacobi, Murder on the Orient Express, The King’s Speech) the solicitor. He pulls a Japanese puzzle box which catches Lara’s eye, technically he is not supposed to give her it until she has signed the certificate. She solves the puzzle box and finds a key and a riddle which leads her to the family mausoleum. Which leads to a secret room where Lara’s fathers secret is revealed and his work on the empress of ancient Japan, Himiko is revealed and a video telling Lara to destroy it immediately. But this is Lara we are talking about and she has a duty to follow her heart and try and find her father and solve the riddle of Himiko’s ability to control life and death. There are goodies (Lu Ren, Daniel Wu, Around the World in 80 Days) and baddies (Mathias Vogel, Walton Goggins, The Hateful Eight) action and more puzzles all in Tomb Raider style. No animals though, which is a shame as wildlife battles always featured in the game. If this film is one of many (no sign yet) it is a good start and will appeal to young girls looking for a role model.